The Tactical Research QRF Alpha B6 Men's Waterproof Boot was designed for members of a Quick Reaction Force (QRF), capable of rapidly responding to developing situations. Gore Tex waterproofing technology keeps water out when its raining or when you're stepping through standing water. 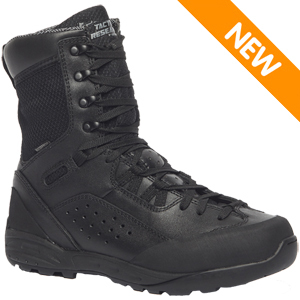 Designed with the performance features of tactical boots and the durability of outdoor trekking footwear, this boot is a hybrid that covers all environments and needs. An aggressive, lace-to-toe closure system provides a secure fit and feel, gaining you confidence during your operation. A medial side rappelling overlay aids in rope rappels and climbs. A low profile soling system to increases dexterity during sensitive situations. A spacer-mesh breathable, hydrophilic lining keeps your feet cool and dry. This boot will add some warmth due to the Gore tex liner. Choose the hot weather version if you're operating in high temperatures.